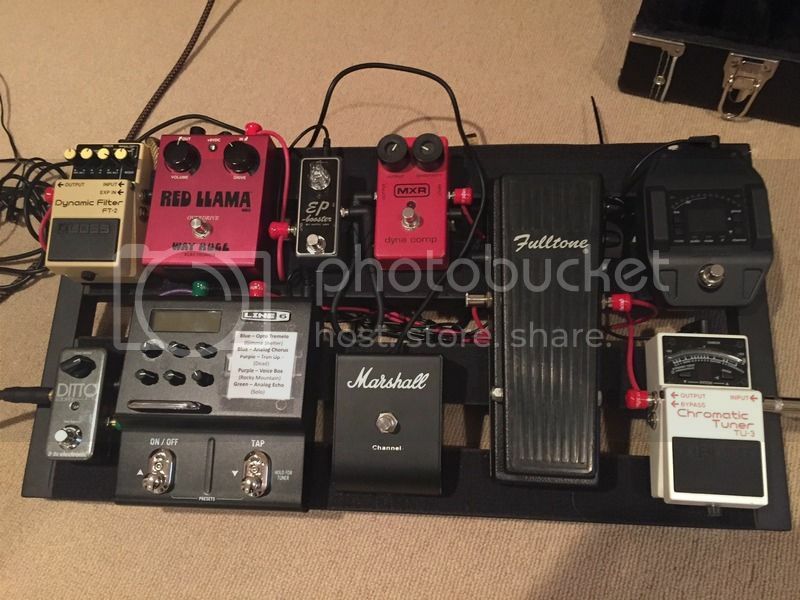 Discussion in 'Effects, Pedals, Strings & Things' started by Zemaitisguitar, Apr 20, 2016. I have everything positioned with my more used pedals up front and less used or as least turn on and keep on in the back. 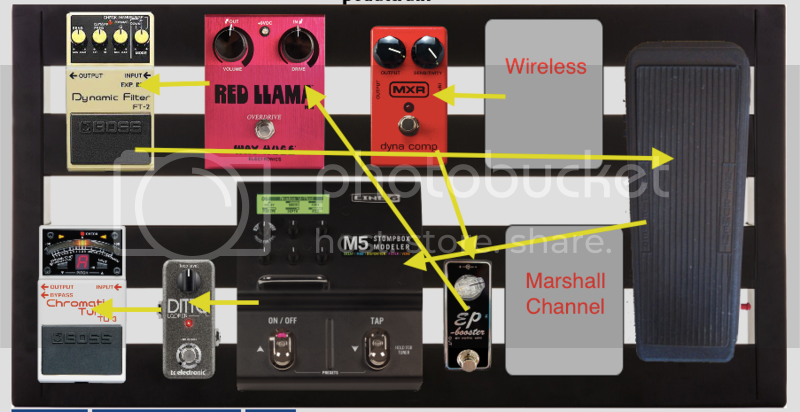 1) I was going to plug into the Wa-wa > Boss FT-2 > M5 > MXR > Shure > Red Llama > Ditto > Booster > Tuner. Do this make sense as far as cabling goes? I haven't played with a looper, so I'm not sure of the best placement for the Ditto. 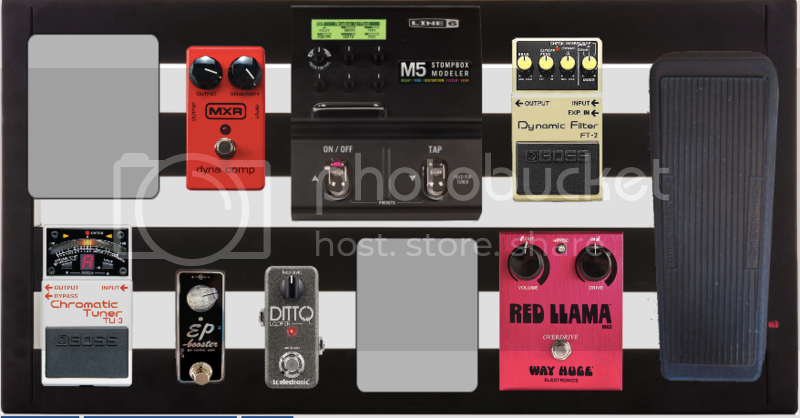 I would put the booster before the Llama, perhaps before wah/filter if you have it cranked typically. What are you using the M5 for? Tuner can be anywhere really, the boss one adds a buffer. If the M5 is mostly for modulation then I'd put that 2nd to last with the ditto at the end. That wireless - isn't that a wireless receiver? If so, it'd need to go first, wouldn't it? oldhousescott and Zemaitisguitar like this. Here is it: I will have to some funky zigzagging to get some of the pedal up front that I need. I usually like my tuner as close to the beginning, if not the very beginning, of my chain as possible for the most accurate tuning. I also agree with oldhousescott, that's exactly how I would do it. You're right, obviously, I was thinking transmitter for some reason <doh>. I also agree with BDB, I like my tuner as one of the earliest devices, so I don't have to turn everything else off just to tune. I suggested after the wah as wahs seem to respond differently when hit with guitar signal directly instead of after a buffered pedal. If the wah is a regular Dunlop, it'll have a buffer stage at the start of the wah circuit, so it won't matter if there's a buffered pedal in front of it. However, with something like a Clyde Deluxe (which is intentionally designed without that buffer stage), I'd also prefer to have it first (without any buffered pedals in front of it). But then again, in this case the wireless receiver is the start of the signal chain. And it will have a low impedance output, just like a buffered pedal. So then it won't matter if the buffered tuner is before or after the wah - either way, the wah will not "see" the guitar pickups anyway. Boom! Thanks for everyone's help!!! Here is it!